Indigo has a long history of extensibility - AppleScript Attachment scripts were available from the start. Later, the Indigo Web Server was added along with the IWS plugin and the ability to add custom images. With Indigo 5.0, we wanted to add a new server plugin API that would allow 3rd party developers to more natively add devices, triggers, and actions to Indigo. This new server API would allow users and 3rd party vendors to implement their own functionality in Python with full access to all the objects and events that Indigo understands (referred to as the Indigo Object Model, or IOM). Finally, users wouldn’t have to wait for us to add support for, say, the Global Caché IR devices, the THUM devices from Practical Design, etc. Someone with sufficient skills could implement support for those devices, have them integrated into the Indigo UI as first-class citizens. No strange variable state hacks, fake X10 devices, etc. - these new devices are actually recognized as real devices in Indigo. What’s more, we wanted to ensure that Python programmers have complete access to everything that AppleScript scripts have access to. While AppleScript is a good language for a lot of things (and we aren’t dropping support for it) we believe that using a more modern, standard, capable, and platform agnostic scripting language is much better for our users in the long run. To deliver this additional functionality, we've introduced a new concept: the Indigo plugin bundle. First, let’s look at the new Application Support folder structure. ￼Notice are the two new folders: Plugins and Plugins (Disabled). 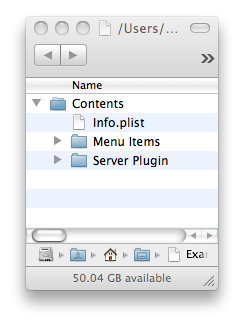 These two folders are where the new plugin bundles are stored (see the next section for details). Plugins that are enabled from the UI are located in the Plugins folder and when a user disables a plugin it’s moved to the Plugins (Disabled) folder. ￼The first thing you’ll notice is that this is actually a real Finder bundle - so it appears to be a single file called Example.indigoPlugin. It’s moved around and treated as a single file, and all the user has to do to install your solution is to drag the plugin file (bundle) to the Plugins folder. First, though, you can see that there is only one top-level folder in the bundle - Contents. All other files/folders are inside that folder. This is the standard Mac OS bundle construction, so we decided to follow the pattern. So, why did we go to the trouble of using the bundle format when there's just a file and a couple of folders? Because in future versions, we're going to add capabilities to the plugin bundle (AppleScript Attachments, AppleScript background scripts, shared images, IWS plugins, etc). We didn't quite get to them for 5.0, but expect them to follow very soon after the 5.0 release. PluginVersion - this is the version number for your plugin - it’s shown to the user in the UI and will help you when supporting your plugin users. This key is required. 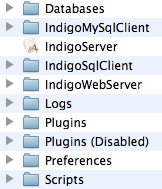 ServerApiVersion - this is the version of the server plugin API as defined by us - for Indigo 5.0, it is 1.0.0. While we hope to keep API changes to a minimum, it’s prudent to version the server API used. This key is only required if your plugin implements a server plugin. Bundle display name (CFBundleDisplayName) - this is a standard Mac OS X key, and its value represents the name of your plugin. It’s used in a bunch of places in the UI, so make sure that it appropriately identifies your plugin. This key is required. Bundle identifier (CFBundleIdentifier) - this is another standard Mac OS X key, and it represents a unique string that represents your plugin. This is used for namespacing where necessary in the code, so it is critical that it is unique. The standard reverse DNS naming scheme is what should be used, although if you aren’t a company you’ll need to figure something out (maybe your blog, etc.). You should limit your bundle id to standard alphanumerics as special/extended characters may cause problems. This key is required. Bundle version (CFBundleVersion) - another standard Mac OS X key, and it represents the layout of the bundle. This is controlled by us, and for Indigo 5.0 it will be 1.0.0. This key is required. URL types (CFBundleURLTypes) - you must specify one URL that represents a web page where your user can get support. Your plugin will have a menu item called “About [PLUGIN NAME]” - when the user selects this menu item, the default browser will open to this URL. Note - this can be a forum topic in the “User Contributions” section of our user forums if you don’t have any other place to host the support page. This key is required. We want the user experience to be very similar for plugins, at least until it comes to configuration and use of the plugin, so you should be careful to get the Info.plist correct. 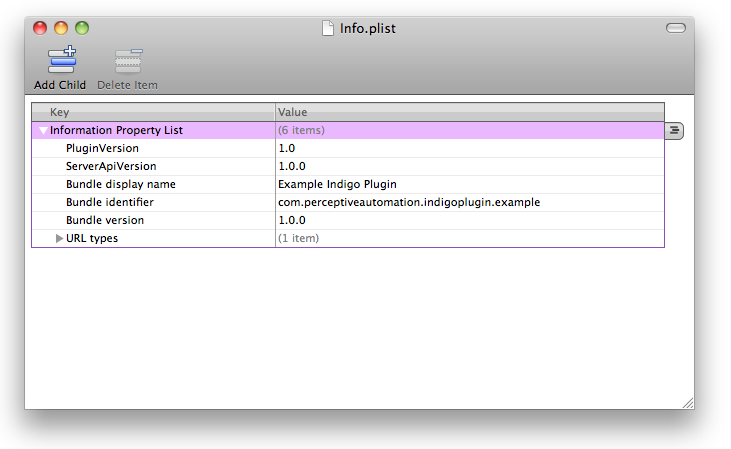 Use the IndigoPluginTester Mac application to do error checking on your Info.plist and bundle construction as well as other formatting checks. You can drop Python scripts and AppleScripts into this folder and they will show up in your plugin's sub-menu on the new “Plugins” menu. When the user selects the menu item, the script is executed. This is a really simple way of giving your plugin some visible UI. In Indigo 4, if you had loose scripts in the “Scripts” folder, they showed up under the “Scripts” menu item in the Indigo Mac Client. This is no longer the case - if you want scripts to show up in a menu somewhere, you'll need to create a plugin bundle with the scripts you want in the “Menu Items” folder. You don't need to implement a Server Plugin to do this - only have a valid Info.plist file and a Menu Items folder with your scripts. The IOM is used for two similar purposes: scripting Indigo and building Server Plugins. They aren’t mutually exclusive, but they serve different needs. For instance, you may just want to write an embedded Python script action vs building a full Server Plugin. 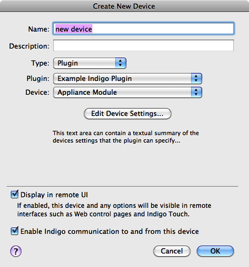 Likewise, you may be interested in building a Server Plugin that doesn’t actually create any new device types, but simply adds events, actions, and menus to Indigo. This is fundamentally different from how AppleScript works with the IndigoServer. here, we need to describe the old AppleScript embedded vs File concept and how it’s no longer necessary for IOM since IOM scripts will be run in a different process anyhow and the fact that Python scripts have to be executed within a specific environment to get access to IOM. defaultValue No You can enter a default value here. enabledBindingId No If you want to conditionally enable/disable this field based on the value of a checkbox, set this value to the id of that field. hidden No If this attribute is set to true then the field will never be displayed regardless of what other options you have set for it. It’s useful if you need to contain some kind of state variables for the dialog that are controlled by button presses rather than controlled directly by the user. id Yes This is a unique identifier for this Field within the context of this ConfigUI element. readonly No This attribute will make the field readonly - useful to show the user data that changes in some other way rather than being manipulated directly by the user - in the example above clicking the Find Node ID button will populate the ID field. tooltip No Unfortunately, enabled text fields won’t show tooltips (Cocoa limitation), so your tooltip should probably tell the user why it’s disabled (since that’s the only time it’ll show) if the field is ever disabled. type Yes This must be textfield. visibleBindingValue No If you specify a visibleBindingId, you must specify the value(s) here. For instance, if you are binding to a checkbox, setting this to false will mean the text field is visible only when the checkbox is unchecked, and a true means the opposite. To make the field dependent on a list or menu, set this value to a comma separated list of option values (item1, item2). You can even bind it to the value in another text field, but that’s probably of limited use. defaultValue No You can enter a default value here. The value must be one of the values from the List element described below. hidden No If this attribute is set to “true” then the field will never be displayed regardless of what other options you have set for it. It’s useful if you need to contain some kind of state variables for the dialog that are controlled by button presses rather than controlled directly by the user. readonly No This attribute will make the field readonly - useful to show the user data that changes in some other way rather than being manipulated directly by the user. tooltip No Unfortunately, enabled menus won’t show tooltips (Cocoa limitation), so your tooltip should probably tell the user why it’s disabled (since that’s the only time it’ll show) if the field is ever disabled. type Yes This must be “menu”. visibleBindingValue No If you specify a visibleBindingId, you must specify the value(s) here. For instance, if you are binding to a checkbox, setting this to false will mean the menu field is visible only when the checkbox is unchecked, and a true means the opposite. To make the field dependent on a list or another menu, set this value to a comma separated list of option values (“item1, item2”). You can even bind it to the value in a text field, but that’s probably of limited use. defaultValue No You can enter a default value here. The value must be a comma separated list of values, each value must be listed as an option in the List element. tooltip No The tooltip will be shown when you hover over the actual list control. type Yes This must be list. visibleBindingValue No If you specify a visibleBindingId, you must specify the value(s) here. For instance, if you are binding to a checkbox, setting this to false will mean the menu field is visible only when the checkbox is unchecked, and a true means the opposite. To make the field dependent on another list or menu, set this value to a comma separated list of Option values (item1, item2). You can even bind it to the value in a text field, but that’s probably of limited use. Static list fields are constructed almost identically to static popup menu fields - with a Label element and a List element which contains multiple Option elements. Each Option element must have a value attribute and that attribute is what is what will be passed back to your plugin when the dialog is validated; it may not contain comma characters. The text inside the Option element is what is displayed for each line in the user interface. type Yes This must be “checkbox”. defaultValue No You can enter a default value here. The value must be either true or false. type Yes This must be label. type Yes This must be separator. type Yes This must be button. An error dictionary. The keys will be the fieldId and the value will be the error string. When the dialog receives this return, it will turn each field with an error red and add a tooltip to the label part of the field so the user can mouse over the label to see what’s wrong. type Attribute Yes This must be one of: relay, dimmer, or custom. We’ll discuss each below. States Element No This element is only used for custom device types. It describes all the possible states for the device. See the description below for more details. In this first iteration of our plugin API, we are going to allow you to define three types of devices: relay, dimmer, and custom. Relay and dimmer devices will share the common UI, states, actions that the corresponding INSTEON and X10 devices do. ￼When the user selects “Plugin” from the “Type:” menu, the “Plugin” and “Device” popups will be shown. When the user selects your plugin from the “Plugin” popup, a list of all the device types you’ve defined will be populated in the “Device” popup. The string in the <Name> element (see above) is what’s used for the menu items. Like a relay device, a dimmer device type will inherit the UI, actions, etc. that all other dimmer type devices have. They have two states: on state and brightness level. They also have a status query action. The XML for a dimmer device would look exactly the same as the XML for a relay except that the id attribute would be dimmer. Note: To increase the value of your plugin, you should ensure that you test and document the necessary information so that Python scripters can script your plugin's actions - for instance, a scripter can tell the iTunes to pause playback. You can provide that information in a relatively straight-forward way in your plugin's documentation as we've done with our plugins (check the Airfoil and iTunes docs for examples). You shouldn't really have to do much - but you should test each action. Sometimes you can make assumptions about the data that you get from your action's ConfigUI that you may want to change - for instance you may expect data when it would be advantageous to not include it (optional data) from a scripters perspective. CallbackMethod Element No 1.0 This is the name of the method defined in your plugin that will be called when your user selects this menu item. ConfigUI Element No 1.1 If you want a menu to open an associated dialog, you can include a standard ConfigUI element (see Configuration Dialogs above for details). No This method is called in a newly created thread after the Start method finishes executing. It’s expected that it should run a loop continuously until asked to shutdown. No This method will get called whenever a new device defined by your plugin is created. In many circumstances, you won't need to implement this method since the default behavior (which is to call the deviceStartComm() method if it's your device and it's enabled) is what you want anyway (see the deviceStartComm() method above for details). However, if for some reason you need to know when a device is created, but before your plugin is asked to start communicating with the device, this method can provide that hook. If you implement this method, you'll need to either call deviceStartComm() or duplicate the functionality here. You can also have this method called for devices that don't belong to your plugin. If, for instance, you want to know when all devices are created (and updated/deleted), you can call the indigo.devices.subscribeToChanges() method to have the IndigoServer send all device creation/update/deletion notifications. Why? Maybe you're logging all device changes - or maybe you're managing a scene and need to know when the devices in your scene change. Subscribing to changes should be used very sparingly since it's a lot of overhead both for your plugin and, more importantly, for the IndigoServer. msg - the string to insert into the event log None If, at any point in your plugin, you set self.debug = True, then any time debugLog is called the string will get inserted into Indigo's event log. If self.debug = False (the default) any call to debugLog does nothing. msg - the string to insert into the event log None If you want an error to show up in the event log (in red text), use this log method rather than indigo.server.log(). should discuss the plugin flow for several types of plugins: with devices, events, actions - and plugins that use runConcurrentThread and plugins that start up threads, etc., so that it'll be easier to try and envision how to approach thinking about a plugin. PySerial v2.5 - just “import serial” at the top of your script. 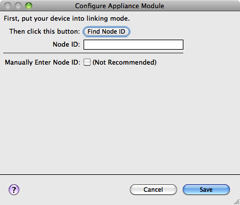 PySerial allows your plugins/scripts to access any serial ports on your Mac. The EasyDAQ plugin uses PySerial for it's serial communication so you may find it useful to look at the code for that plugin for examples. py-appscript v1.0.0 - “import appscript” at the top of your script. Appscript allows you to use apple events to control other applications. Apple events are what AppleScript uses - py-appscript uses the same underlying events. The syntax is obviously Python but it requires a little getting used to. The Airfoil plugin uses py-appscript so you may find it useful to look at the code for that plugin for examples. simplejson v2.2.1 - simplejson is included in Python v2.6 and higher - but since we're using 2.5 we've included it in the install. Just “import simplejson”.